This bottle of Cà dal Non Aceto Balsamico Tradizionale di Modena Extra Vecchio DOP has been aged for a marvelous 25+ years. It is aged in a series of wooden barrels in Modena. 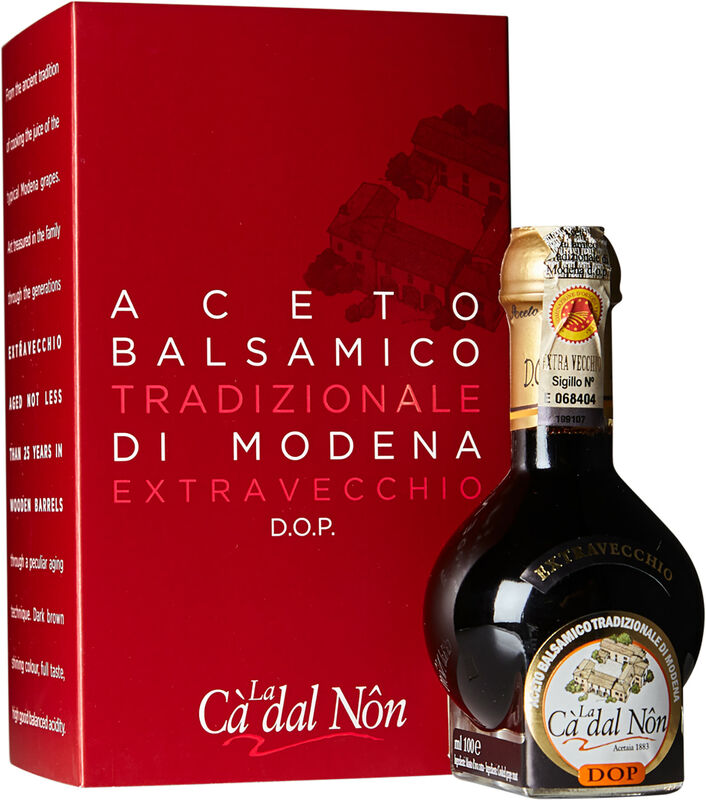 Its consistency is thick and viscous - even more so than its younger cousin Cà dal Non Traditional Balsamic Vinegar. Our vinegar producer in Modena, Mariangela Montanari is the most balsamico-passionate and all around enthusiastic person that you will ever meet. She says that traditional balsamic vinegar shines when paired with dishes that are salty and fatty. “This is one of the easiest and most distinctly Italian ways to improve a dish and make it so special.” Our favorite way of enjoying Cà dal Non is pure and simple...a few drops straight from the bottle go a long way to enhance a piece of roasted salmon, a grilled rib eye, a perfectly ripe peach, or even fresh vanilla gelato. Mariangela's Aceto Balsamico Tradizionale is made with Trebbiano Modenese, Sauvignon Blanc, Pignoletto, Spergola, Occhio di Gatta, and Lambrusco grapes. Need a quick refresher on the difference between plain old vinegar and traditional balsamic? The word Aceto, vinegar, in Italian, derives from the latin acētum, whose root means "to be pungent."